Tirupur Pandit Hosiery Millss Private Limited was established in 1974 by Mr. N. Subramanian with a modest capital of a few hundred dollars, over the period it has developed in to 3 star export house(recognised by Government of India) and ISO 9001 with an yearly turnover of around 20 Million USD. We are experienced over 3 decades (35 years) in the garment business and over the last 25 years we have been exporting to most of the European countries such as UK, Denmark, France, Germany, Italy, Sweden, Austria, Hungary, Spain, USA and Mexico. We produce lot of High Fashion wears for Men's, Lady's & Kids which includes all types of clothing such as T-shirts, Shirts, Sweats, Pants, All types of Underwear garments, Shorts, Skirts & Pyjamas. At current date (2007/2008 season) we have over 2500 machines, 4500 labours and staffs working for us. Also have a separate sampling unit which has over 100 machines with a work force of 150.
clothing such as T-shirts, Shirts, Sweats, Pants, All types of Underwear garments, Shorts, Skirts & Pyjamas. Innovative designs are created using CAD and the processed fabric is cut by cutters. 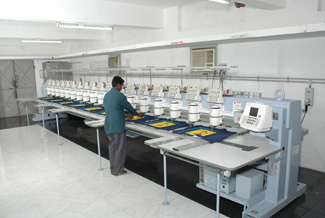 Our embroidery unit has the latest and world’s best machines from the manufactures of Barudan, Tajeema, and Happy. We can handle all type of embroidery designs with appliqué, sequences, etc. 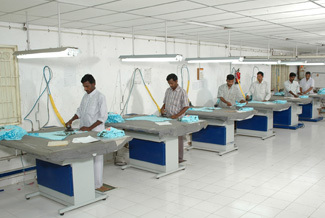 Modernization at various stages has resulted in state-of-the-art production facilities. Our stitching unit has a huge capacity of well-equipped sewing & finishing machineries that can produce international quality finishing. The unit has the capacity to do 200000quality pieces per month. Our in-house Quality Department is well set with qualified experienced dedicated team, which will monitor various stages during the production to ensure “Zero Defect”. All the garments are being tested thoroughly and checked by our quality assurances team before team before it gets packed.